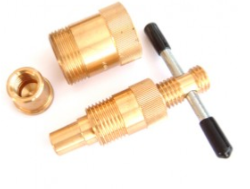 Ideal when removing 15mm or 22mm olives from copper piping without damaging the attached pipe. This puller simply utilises the compression fitting locking nut to remove the olive from the tube, instead of cutting the compressed olive. With all the major parts of the tool turned from brass this olive puller provides a quick and reliable remedy to removing most 15 and 22mm olives.